Offer your patients the benefit of enhanced comfort, and offer your staff the benefit of improved efficiency. Our products ensure your practice sets a new standard in quality of care and patient satisfaction. Become a Patient Comfort Leader. Although rewarding, being a private practice physician isn’t always easy. In addition to caring for patients, you’re also running a business. Every decision you make can affect patient loyalty and future success. To be a leader, you have to offer the best. The best way to ensure current and prospective patients see you as the best provider, you have to raise the bar in patient experience. Gebauer’s Patient Comfort Solutions provide you and your staff the opportunity to treat patients thoroughly, quickly and with as little discomfort as possible so you can outshine the competition. Differentiate your practice by offering more options for patient comfort. 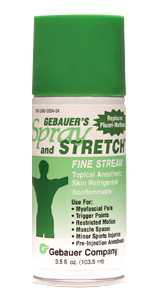 Gebauer's Spray and Stretch® is an instant topical anesthetic skin refrigerant that effectively manages myofascial pain and trigger point release when used in conjunction with the spray and stretch technique. Published clinical trials support the use in children three years of age and older. 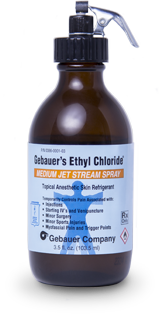 Ethyl Chloride is FLAMMABLE and should never be used in the presence of an open flame or electrical cautery equipment. Inhalation should be avoided as it may produce narcotic and general anesthetic effects, and may produce deep anesthesia or fatal coma or cardiac arrest. Do not spray in eyes. Over spraying may cause frostbite. Freezing may alter skin pigmentation. The thawing process may be painful and freezing may lower resistance to infection and delay healing. Cutaneous sensitization may occur, but appears to be extremely rare. Long term exposure may cause liver or kidney damage. CAUTION: Federal law restricts this device to sale by or on the order of a licensed healthcare practitioner. Do not spray in eyes. Over spraying may cause frostbite. Freezing may alter skin pigmentation. Do not use this product on persons with poor circulation or insensitive skin. Do not use on open wounds or abraded skin. If skin irritation develops, discontinue use. CAUTION: Federal law restricts this device to sale by or on the order of a licensed healthcare practitioner.